As if you needed another reason to donate to our endowment fund, here’s a video I just compiled showing the links between our founder and Birankai generations, as shown in one class from 2012 Summer Camp. Watch Chiba Sensei demonstrate, then the other Birankai teachers. It’s truly inspiring. The compilation above was sparked by the nice work of Francisco Del Valle at New York Aikikai holiday seminar last weekend — the third Aikido seminar I attended in as many weeks. First was at Brooklyn Aikikai, where Jenny Flower Sensei of Athens took my breath away with her focused and powerful energy. Then I took a cheap flight west (thanks, Jet Blue!) to see John Brinsley Sensei at San Diego Aikikai, where he brought together the best of Hombu Dojo and the legacy of Jack Arnold Sensei’s classic Birankai Aikido. Last, I was lucky to drop in to New York Aikikai and get some great training with our USAF friends. Yamada Sensei reiterated his support for our organization and his strong ties to Chiba Sensei and his family. Through Birankai seminars and other events, our connection with the foundation of our Aikido is alive and well, but we need more resources to keep Chiba Sensei’s spirit thriving, especially in small and remote dojos. If you can, please consider donating. Darrell Bluhm Shihan of Siskiyou Aikikai in Oklahoma. Martial arts are paradoxical. In one way they are a singularly solitary pursuit. In other ways, they are entirely about relationships and community. 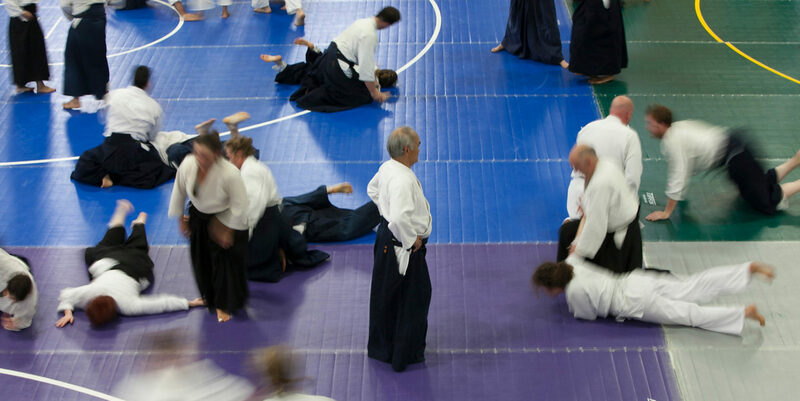 Many years ago, when I lived in the Northeast, I used to look at Aikido seminars from the perspective of “I.” There were many seminars nearby and I could easily take in one seminar a month to augment my training at the dojo. It was an opportunity to expand my horizons, gain new perspectives on technique, and nudge myself to a higher level of training. Now I have my own dojo in Kingfisher, a small Oklahoma city, in an area where the travel time to a seminar would significantly exceed the training time at a seminar. My students have now become a community that is as much of my concern as my own personal Aikido development. I cannot easily abandon my teaching to travel. Neither can I automatically expect my students to make the additional heroic commitment of time and money to travel a great distance for a weekend Aikido event. My personal aspirations as a martial artist and my responsibility to my dojo community were not necessarily aligned. Then enter Birankai, another level of community. I think, “Hmmmm, I still only have a hand full of students and cannot remotely afford a Shihan visit, even with an endowment grant.” So I reach out to Read Omohundro Sensei, my nearest Birankai neighbor. He has a small dojo three hours away in Muskogee, OK. Can we partner up to do this? – another level of community. “Yes, certainly. Let’s do this. We will share the responsibilities needed to make this happen.” Next step is that we reach out to Darrell Bluhm Shihan. We have kind of known him for years at summer camps. However, Read and I are not his personal students and inviting him to live with us for a weekend is another level of relationship. Still, Read and I have a big dilemma. Between the both of us we still don’t have enough dojo membership to fund the seminar, even with an endowment grant. The normal seminar solution is to invite other area dojos. Not so easy in Oklahoma. Other Birankai dojos are at least a travel day away. The only remotely local dojos are all non-Birankai and mostly non-Aikikai at that. We are presented with another logistical problem. Wheatbelt Aikido, in Kingfisher, and Three Forks Aikido, in Muskogee, are three hours apart and neither is in a central area that is easy to get to for area dojos. Naturally, Read and I were keeping Bluhm Sensei appraised on our evolving arrangements and the mixed nature of our seminar attendees. At the end of the day, it all came together. Read and I managed an event in an environment that we did not control, but still orchestrated to bring it up to Birankai Shihan standards. Our students got to spend some delightful and precious one-on-one time (on and off the mat) with a Birankai Shihan. We all got to work together and know Sensei Darrell better as a person. We built some good bridges to the Oklahoma non-Birankai community. Particularly the ASU and independent dojos and the non-Birankai attendees got to see that we do some really nice Birankai Aikido that was not outside of their ability to grasp and aspire to. We could not have had this seminar without a multi-tiered level of support and partnering; both inside and outside of Birankai. Mine and Read’s dojos are small, but we chose to think and act big. I’m a small guy, but if when I step on the mat and I am in harmony with the universe, great things can happen. 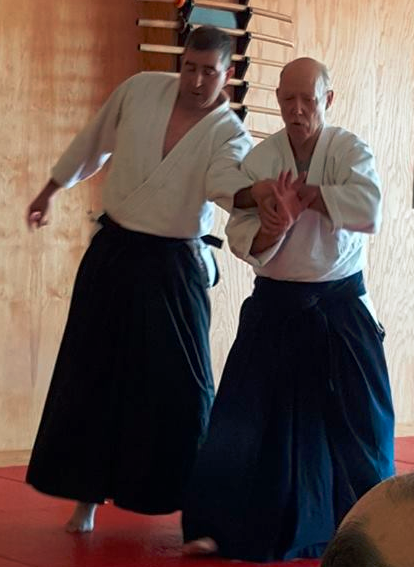 O-Sensei’s perspective of Aikido being “love” presupposes a relationship of “I and Thou.” This Oklahoma seminar was the most relationship-intensive one that I have ever participated in. The Aikido relationship is not just about the uke-nage technique partnering on the mat. The interaction of making the seminar happen and interacting with Sensei Darrell on and off the mat were an essential part of our local growth, both personally and as a community. Make a seminar happen at your dojo. You are not too small or insignificant. If you need more help, then do more work to get the help. Our Birankai president, Alex Peterson, even flew in to attend…now that is real, personalized support!! We all need to support Birankai’s funding of these events. Please always keep the endowment fund and other Birankai fundraising in your hearts, even at times when it is not possible to do so from your pockets. Editor’s note: There are few days left to donate to our Birankai Endowment Fund for the 2015 tax year — help fund great events like the one described above! All of us practicing Birankai Aikido benefit from the T.K. and Mitsuko Chiba Seminar Endowment Fund, which helps support seminars in small dojos. Let’s all include this excellent cause in our holiday giving this year — it’s tax-deductible and no gift is too small or too large.